NARRATOR: I had to be careful. the Great North Union was a success story, and that meant it had enemies… and it knew it had enemies. 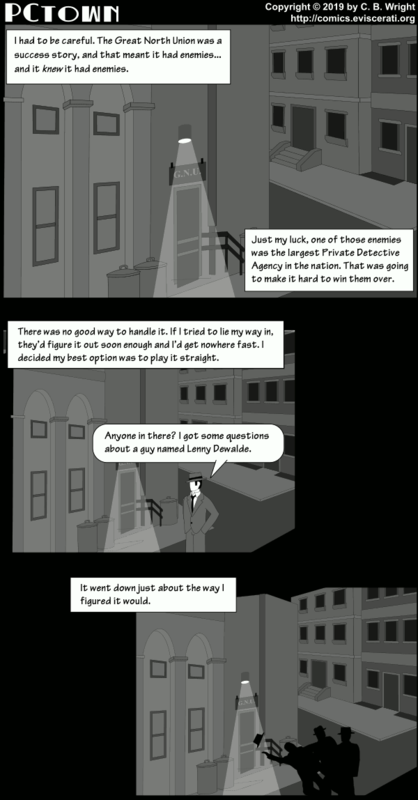 Just my luck, one of those enemies was the largest Private Detective Agency in the nation. That was going to make it hard to win them over. NARRATOR: There was no good way to handle it. If I tried to lie my way in, they’d figure it out soon enough and I’d get nowhere fast. I decided my best option was to play it straight. JAKE NERO: Anyone in there? I got some questions about a guy named Lenny Dewalde. NARRATOR: It went down just about the way I figured it would. It did take a couple read throughs to get what “That was going to make it hard to win them over.” was talking about.